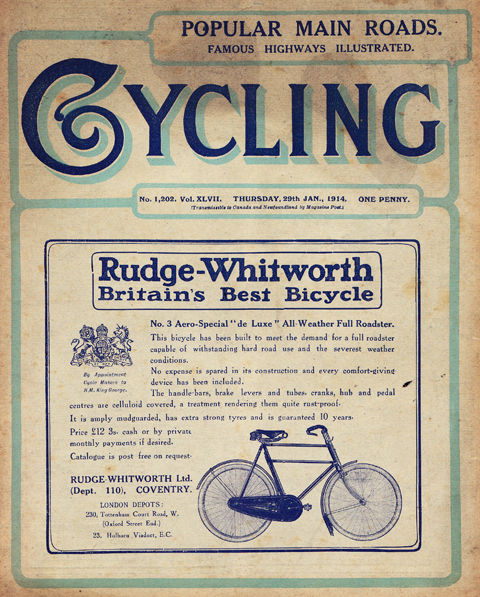 According to the catalogue, opting for a coaster brake on your double top tube Rudge-Whitworth All-Weather cost an extra 14/- and its model designation changed from No 3 to No 341. The description suggests that a coaster brake would replace the back rim brake. As the coaster on this example is an Eadie 2-speed, it retains both rim brakes. So it has three brakes in all. It was very well fitted out from new. 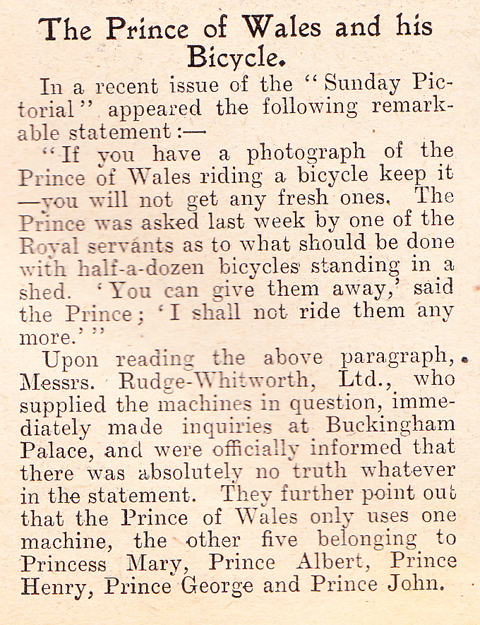 As well as Rudge-Whitworth’s tradtional ‘V section’ mudguards, the celluloid-covered ‘No 76’ handlebar with inverted brake levers was standard issue. There was a choice of either two-bar or four-bar pedals; this one has the older style four-bar (or ‘split’) pedals. Another attractive detail is the oilers above the bottom bracket and on the hubs – their tops display the Rudge-Whitworth ‘hand’ logo. This appears to be an old-time restoration. It’s fitted with an attractive Brooks ‘B90’ saddle, is in good mechancil condition and it rides well. The No. 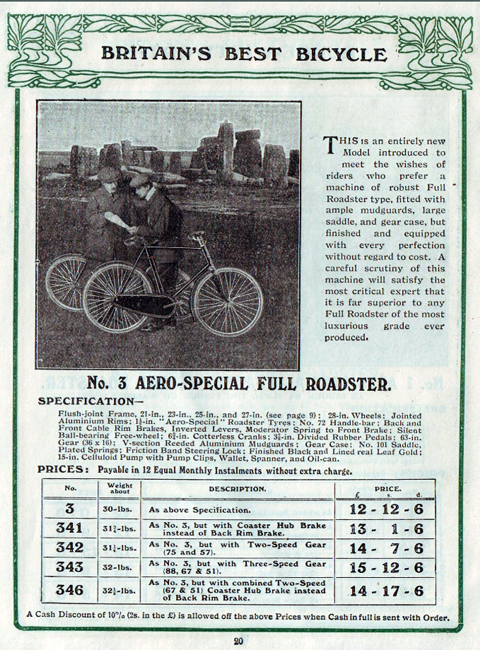 3 Aero-Special Full Roadster model was introduced in 1906. 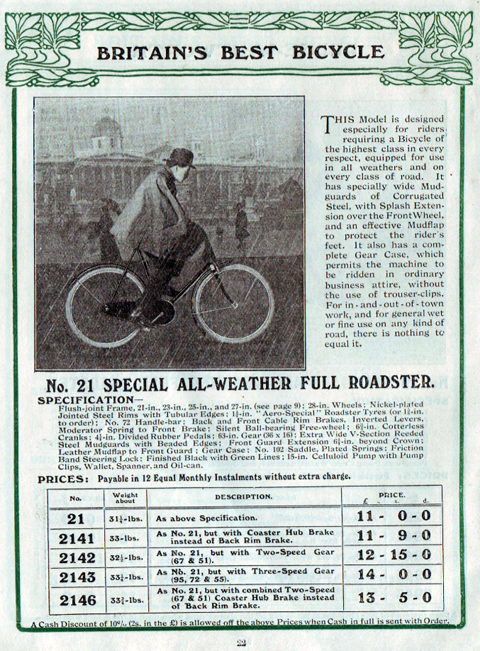 As you can see in the 1906 catalogue, above and below, there was also an All-Weather model. By 1909, these two models appear to have merged into the No. 3 Aero-Special ‘de-luxe’ All-Weather Full Roadster, below.